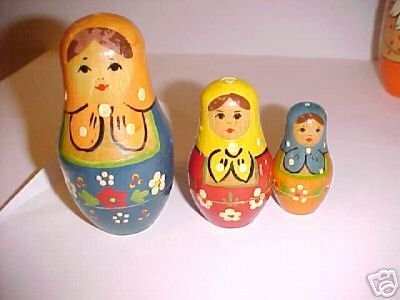 This a very old 3 piece Russian nesting doll set made in the USSR. Similar sets are pictured on page 62 of Michele Lefkovitz's book. This set is in good condition, with some chipping. The set is not complete, as the smallest does open. Approx 2" to 4 " tall Dot Maidens like these are very scarce and hard to find.